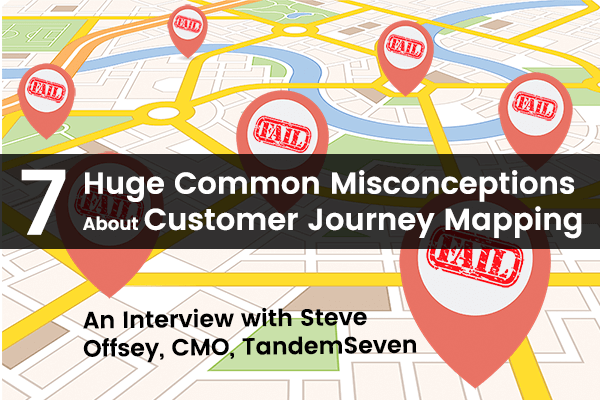 In this insightful interview, expert Steve Offsey debunks seven of the most common customer journey mapping misconceptions, myths and mistakes that cause marketers to fail. Customer journey mapping is a relatively new concept, but it is a term we are beginning to hear more and more frequently in the digital marketing community and business world every day. Reports have shown that over 1/3 of companies have already adopted customer journey mapping, and that number is increasing quickly. The customer journey is an important part of the customer experience when it comes to business. If you are running a small business you may want to ensure that your customers are getting they need for you, especially if you have an e-commerce business this is why it some business use something similar to stitch labs to ensure that they are able to get their customer experience right. There are a lot of places that might be able to help you understand the customer experience and journeys, such as customer journey by Luth Research. As marketers look to leverage customer journey mapping for the first time, or improve results from existing efforts, I wanted to find an expert with deep experience who could pass along some knowledge that might help. Steve Offsey was at the top of my list. As CMO and GM, Products at TandemSeven, a leading provider of digital experience solutions and customer journey mapping software, Steve has worked with companies such as US Bank and Waters Corporation to improve their customer journey mapping and customer experience initiatives, learning from their triumphs and failures along the way. 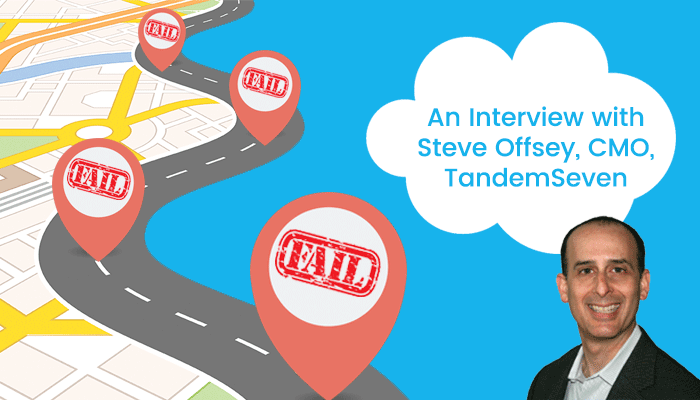 I recently had an opportunity to catch up with Steve, to get his insights on what marketers should know in order to be successful with customer journey mapping, common mistakes to avoid, and misconceptions that need to be cleared up. According to Steve, a surprisingly high number of companies are guilty of forgetting a crucial step when putting together a customer journey map – actually getting input from real customers. STEVE OFFSEY: One of the biggest ones that we always see is people who think they are doing customer journey mapping but they are really doing service design. The whole idea of customer journey mapping is to map the journey from the customer’s perspective. I often see organizations get a whole bunch of people into a room, document their internal process and call that a customer journey map. That’s the biggest misconception. People think you can get all of your staff into a workshop and come up with the customer journey map, without ever having to actually talk to customers. We see a lot of people do that internal workshop; they’re all super-charged and excited, everyone’s up there with the whiteboard and their sticky notes, and they get it all down, and then they say, “we’re done.” When in reality, this is just the first step to get going, not the final destination. With your current state map of the customer experience, you can start looking at where the poor parts of the experience exist. What does the customer really want to do? Once you have completed and tested your current state map, then you can go and define your future state map of where you need to go. The gap analysis between the two drives your planning. In a digital world that caters to the values of personalization and individualism, treating every customer the same is one of the quickest ways to kill your results. 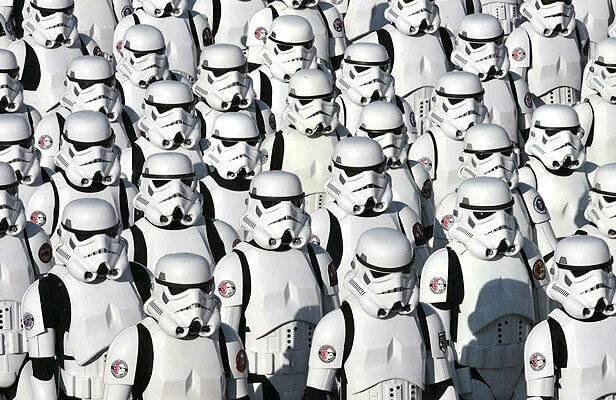 Unless you are marketing to clone troopers, a one-size-fits-all approach is usually not a good idea. There is no such thing as one generic customer or one generic journey. However, Steve suggests many marketers fail to understand this important lesson when creating customer journey maps. STEVE OFFSEY: Another common misconception is that there is just one customer journey map that applies to all customers. Really, the fact is different customers often have different journeys. Many journey mappers do not understand the link between customer journey mapping and personas. With different personas, you’ll usually have different journeys. They’ll also have different emotional reactions, different “wow” moments, different places where the experience of the journey is good or bad. And even if two personas are taking the same journey, they may have a different perception of it. Steve shares how marketers have somehow gotten into the habit of developing personas based upon information that is not only often the least important, but flat out made up, and inaccurate. As a result, instead of accurate snapshots and profiles of your individual customers, many organizations’ personas end up being nothing more than constructs of marketers’ own imaginations. That’s right, this means many of us are more-or-less out there marketing to fictional, make-believe characters. STEVE OFFSEY: Personas became really hot in marketing a while back, and since then we somehow ended up down this weird rabbit hole of personas being defined predominantly by demographic data. So everyone began creating these personas where they gave them cute names, and told you how old they were, you know, they had two kids that played soccer, and all these things that should really be the very last details that you want to add to make your personas come alive at the end, not the primary criteria you use to define your personas in the first place. The biggest mistake marketers make here is that they create customer personas through internal exercises, without ever conducting any real customer research, talking to real people, or collecting real data, which results in the creation of non-realistic customer personas. It’s almost like inventing your own characters. With this, you are not really uncovering the most important information necessary to identify meaningful differences between how different types of people go about researching a product or service, interacting with your brand, and taking disparate routes in their customer journeys. Referencing the work of Tony Zambito, Steve recommends a goal-directed approach as a much more effective strategy for customer persona development, which entails understanding how customers’ goals, objectives, problems and pain points differ, how they drive different behaviors, and how your product or service aligns with helping customers attain those goals and solve their specific problems. Just having a map doesn’t automatically bring you the treasure. Pretty pictures don’t drive business results. Steve explains how many companies mistake what’s really just the end of the first lap, as being the finish line. STEVE OFFSEY: A lot of journey mappers view the creation of a journey map as a final destination. However, hanging up a pretty picture on the wall is not sufficient to make your company more customer-centric. Companies often create a hypothesis map and have a bunch of designers go into Adobe Illustrator and make it beautiful, print it out, and think that’s it. They think, “We do this activity, we create the map, and we’re done, call it a success.” The fallacy here being that they can just do this once, hang it on the wall, and declare success. What ends up happening afterwards is, well, absolutely nothing. It is a huge misconception that just doing it is going to yield something. You can’t operationalize customer journey mapping and drive results with just a pretty drawing. Journey mapping really needs to be operationalized if it’s to serve as a vehicle to make your organization more customer-centric, and to improve customer experience. By operationalized, I mean it’s not a one-time activity. You should be continually talking to customers, refining and adding detail to your customer journey maps, getting new ratings of customer experiences, and monitoring changes over time. I provide some tips on how to address these challenges in a recent post on CustomerThink called 6 Ways to Make Sure Your Journey Maps Improve Customer Experience. According to Steve, many marketers share the common misconception that website activity is all there is to it when it comes to customer information needed for customer journey mapping. However, in reality, website behavior is just a sliver of the complete customer journey data pie. Oh and by the way, customers are in fact, not robots. You need human data. STEVE OFFSEY: Some people think that you can make a journey map just based on website logs and data. You can’t just look at the breadcrumb trail of what your customers did and the steps they took on your site. The customer journey spans way beyond your website. You also really need to understand what customers were trying to do that your site didn’t let them do, what their emotions were, how they felt while they were doing these things, or not doing these things. These are examples of various important aspects that you can’t find in just log files. 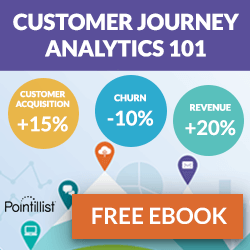 You can’t just create a customer journey map based on some web logs and some statistical tool. You need to move outside of your comfort zone of focusing on just the buying process, because as you’ve written about (on Customer Journey Marketer) the customer journey extends both before and after the purchasing process. I asked Steve to elaborate on some of the more common different types of data companies should be collecting to get a more complete picture of the customer journey, and thus, a more effective journey map. Customer Journey Stages. The basic steps along the path that customers pass through at different points of the customer journey. These should be defined based on goals and objectives from the Customer’s perspective in the previous bullet, and not your internal POV or processes, the mistake we saw in #1 and #3 above. Goals and problems. Also sometimes referred to as wants, needs or expectations, these are about understanding the different objectives individual customers are looking to accomplish at each juncture along the path of the customer journey. Touchpoints. Touchpoints are the points of interaction that your customer has with your brand, or outside of your brand, as they seek to meet their specific goals and needs across different stages throughout the customer journey. A touchpoint is the intersection of customer actions with a specific tool or resource. Emotions. You definitely want to capture emotions because people aren’t robots. I believe most B2B purchasing decisions are really made largely by emotion, not just rationally. Even if they give their boss a grid to prove why their decision is rational, they’ve been influenced by a lot of other emotional factors that aren’t in that grid, like who they trust, how they’ll be perceived by their peers, etc. The Tempkin Group has proclaimed that this is “the year of emotion.” You really need to get people to describe how they were feeling at times, and you need to do that through interviews. Evaluation of the experience. Not just how it made you feel, or what you were thinking, you need to get customers to rate their experiences at various parts of the journey, which you can often do with things like surveys. This is where you can start turning customer journey maps into more than just a static, one-time exercise, and into more of an operational model. No. As Steve points out, despite what MarTech vendors might have you believe with misleading messaging, no technology can build an effective customer journey map for you. It takes a human to market to a human, and lots of hard work. STEVE OFFSEY: Many marketing platforms and solutions have jumped onto the whole “customer experience” messaging bandwagon, and are now throwing around language on personas and customer journey mapping, which has created a bit of confusion in the digital marketing community. There’s a big difference between your operational platforms like your marketing automation system and CRM, and the process of actually understanding what your customers’ journeys look like, capturing and documenting customer journeys, and getting your entire organization aligned with them. Where the confusion occurs is when you have people thinking “I can skip this messy, time consuming research process, because my operational marketing technology can do this for me.” The truth is, none of those platforms or systems do anything like that for you. These platforms are great for creating, deploying and automating interactions with your customers based on the insights you’ve developed through journey mapping. 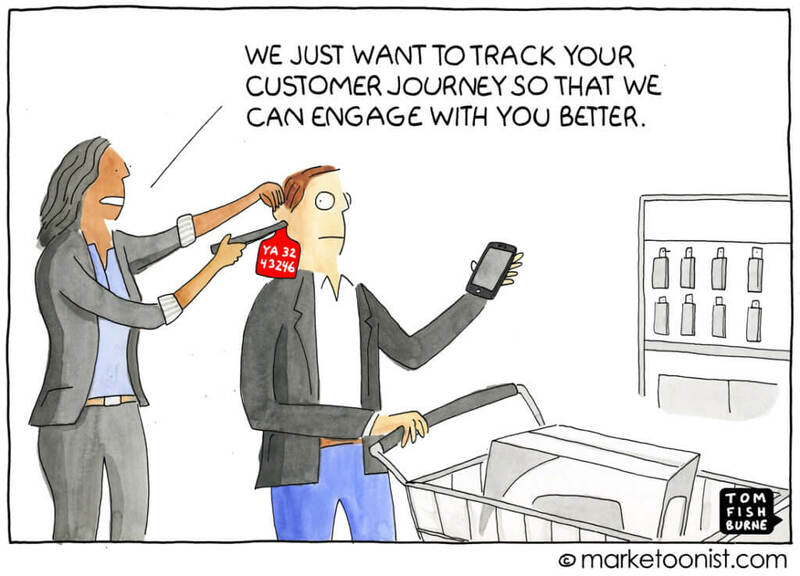 There are also some solutions now labeling themselves as “journey analytics platforms” trying to make it seem like if you just feed them a set of big data and web logs, they’ll show you what your customer journey maps look like and, in some cases, even operationalize it for you. They market themselves as “auto-magic solutions” with no thinking required. What all these solutions are really doing is telling you what your customers are doing online within the constraints of what you’ve already set up. They won’t tell you what your customers really wanted to do that you failed to deliver them as an option, or what really influenced their thought process that caused them to take an action, or not take an action. It’s kind of like treating your customers like laboratory mice you’ve created this digital-only maze for, and this technology will tell you how the mice are running through it. 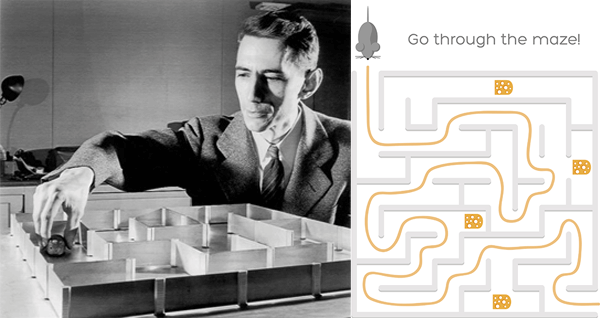 What if the mouse doesn’t really want to run through the maze? What if they’re pissed off about the experience while doing it? What if different mice want the cheese for different reasons? No marketing technology will tell you any of that. It’s not so much the input, but rather what you are able to do with the output. Once you’ve gone through the research and customer journey mapping process, you can then use your marketing technology to do things like helping to identify customer personas and what stage of the journey a customer might be at, and align some of your marketing communications and campaigns accordingly. Even for companies that manage to avoid the rest of the mistakes on this list, Steve suggests that lacking internal alignment is another common mistake that can severely hinder results. 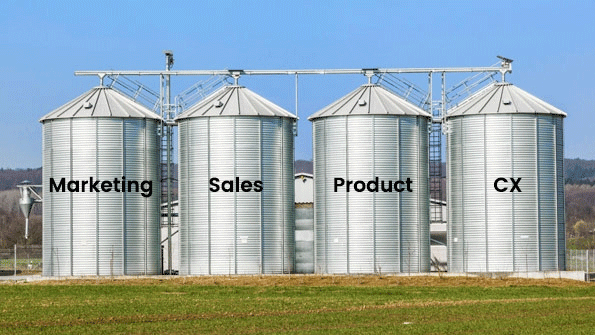 STEVE OFFSEY: What I’ve seen with a lot of companies is that customer journey mapping can start in separate silos, different functional or business unit silos. What ends up happening is the CEO will all of a sudden realize that the customer should see them as one company, but internally they are working like every function or business unit is a separate company, with their own personas and customer journeys. The consequence of this is that you come across to your customers like multiple companies, or a fragmented, inconsistent company, as you are addressing them very differently at different points in their journey, and not taking a single customer-centric view of the experience. Not to mention you’re duplicating efforts all over the place. You need to coordinate across groups and get unified on your goals, personas, journey maps and stages, which means getting internal stakeholders aligned. You not only need to establish well-defined goals, but also make sure those goals are aligned with internal stakeholders so that they are mapped to what the business is trying to accomplish at a higher level. This is also important so that people understand why you are doing customer journey mapping in the first place, so they can help operationalize it. If everyone is aligned on the same goals, they can help drive towards reaching them. I provide more details on how to accomplish this in a post called How to Set Up Your Customer Journey Mapping Project for Success. Forecasts indicate that the adoption of customer journey mapping is set to surge. Meanwhile, countless companies out there may be destined to fail as a result of the seven mistakes Steve shared in this post. How will this all play out in the next few years? STEVE OFFSEY: Using the Gartner Hype Cycle, customer journey mapping is climbing the “peak of inflated expectations,” and will likely crash into the “trough of disillusionment” at some point because a lot of people will be investing resources in poorly executed projects that don’t produce real results. I’ve actually had one company tell me recently that they’re not calling it “customer journey mapping” anymore internally, and that they’ve had to come up with a new name for it to distance themselves from the failures of historical journey mapping projects. In the next two or three years we’ll go through this phase where the bubble will burst as all the people out there making these common customer journey mapping mistakes we discussed today will start saying it doesn’t work. Then the people who are actually investing the time and effort to do it right, and operationalizing it, will start realizing more and more value and better results. Those companies are going to have better customer experiences, and as a result better reputations, and stronger brands. They will emerge as leaders in their markets, and start sharing their best practices for how to be effective with customer journey mapping. At that point, everyone will be back on the bandwagon, and we’ll climb back up to a mainstream level of adoption. Do you have any common customer journey mapping misconceptions and mistakes to add to this list? If so, be sure to leave a comment, we’d love to hear them! Gary DeAsi is a global digital marketing and demand generation expert with a passion for technology, content and thinking both analytically and creatively to overcome business challenges at every stage of the customer journey. As Director of Demand Generation at Pointillist, Gary is responsible for building and fueling a modern, revenue-centric marketing engine to accelerate growth for Pointillist’s game-changing Customer Journey Analytics and Orchestration software.Prior to Pointillist, Gary held several roles at SmartBear Software, from leading the demand generation team, managing the global corporate brand, to heading up marketing operations. His initiatives helped SmartBear earn back-to-back Marketo Revvie Awards for Most Dramatic Business Impact and Most Creative Integrated Marketing Campaign. Also an expert in lead nurturing and marketing automation, Gary has been honored as a three-time Marketo Champion. Customer Journey Marketer is a blog about leveraging the art and science of digital marketing and knowledge of the customer journey, transforming anonymous web visitors into loyal brand advocates.